The Unlimited Outside Requires an Unlimited Inside. 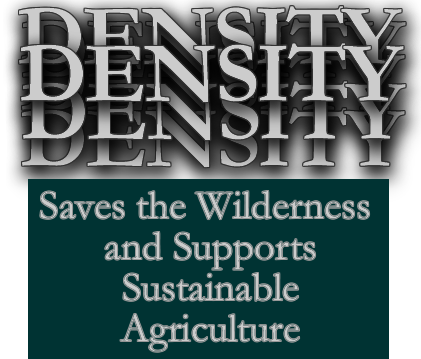 Density Saves the Wilderness and Supports Sustainable Agriculture. The global colonization and destruction narrative promotes investment in every technical solution required to sustain centuries of powerful economic growth except one – population. Population growth is without a technical solution as it demands of humanity, even for a review, a postponement of morality[i]. Nevertheless, this process continues as a known reality of human behavior that is exhibited this way: one group says to another, “you are not selected.” The main difference today is the globalization of this statement and how it will put terms on the conditions for survival starting with basics, such as food and water. The arrival of a world food production and distribution market system provides the most insight into globalization. Like the known environmental impacts of the global energy market, industrial agriculture is also open to similar levels of disruption assigned to human error or lack of restraint. The dangers linked to one-crop production failures are well known but on a balance sheet the cost vaporizes easily by mitigating threats with cheap poisons and GMO technology and crop insurance. Helena Norberg-Hodge retains the status of profit. The path sustained thru 10,000 years of human development has depended on the role of water and air to “sweep away” the detritus of human effort and endeavor. Thus, a new path is required as the smoke of one place is the wind of another. The arguments for change on this subject are plentiful but spend just twenty minutes (TED) sums up the chief complaint and neatly outlines the work required of every individual regarding the human capacity for re-adaptation and diversity beginning with food. It needs to be close and thus local. Martha Noble’s presentation at the National Conference to End Factory Farming in October 2011 presents the devil in the details of an impending catastrophe that underlines the Norberg-Hodge argument. Simply put, the third largest fund and single largest program of the Farm Bill is crop insurance acquired by the largest farms. [ii] Put directly, ‘the people’ will pay for failures and add starvation to the ledger as the assigned risk of the people served. Ms. Noble’s general observation of the USDA came in a closing remark paraphrased as follows: In 1995 when visiting the USDA for the first time with some questions about the agency, she was proudly handed a pamphlet that explained how Iowa farmers could now receive food stamps. The national policy governing the finest farmland in America subsidizes people’s access to fruit and vegetables while assuring cheap feed grain for cows and pigs. When an action in response to a loss (such as a majority of sustainable family farms) turns into a reaction to an unknown, the change caused is well known. It begins with denial, often followed by anger. After that, a process of bargaining begins to stimulate an assessment of potential losses that include the possibility of total forfeiture. This condition is the known psychological state of an individual facing a crisis. Without a doubt, this state is shared by many groups of people who fully understand the metrics of devouring world resources at exponential and incommensurable rates [iii]. Finally, there is the group hell-bent on serving this ability with industrial technologies. Coming to know that the earth has a “limited carrying capacity”, and becoming able to do something about it locally is the prime existential question of human history. William Vogt put it this way. “Until this understanding becomes an intrinsic part of our thinking and wields a powerful influence on our formation of national and international policies we are scarcely likely to see in what direction our destiny lies.” It is as if we are asked to choose between two roles. The first is that of Donald Worster, who documents a careful celebration of Nature as a vital behavior. The second is that of Edward Abbey, who demands that our responsibility includes scraping the scum off the top of Nature’s brews, starting with people that do irreparable damage. Given the continuous growth model and a market system designed to serve every need, the threat of overpopulation is trumped easily by the governance question. When every need that can be satisfied with capital excludes public reforms and protections, the growth process begins to fail at the local and national level, and the prospect of global reform initiatives capable of curbing abuses becomes unlikely. As this perspective holds true and the dangerous impacts are proven, a more conciliatory approach that keeps the spread of urbanism within a limited area will gain strength. Within this environment, the unknown upper limit of the earth’s population becomes a matter of selection within a human decision-making framework that serves each life to the fullest. The vital aspect of this potential is how it offers a way to overcome the history of natural selection primarily because we see it as inhuman. Retaining the urban potential for unlimited capital growth is grounded in housing and the design for urban living. This formation of an “unlimited inside” also gives way to an “unlimited outside”, and like the vast human diversity of the former, the potential for an equivalent natural diversity of the latter not only becomes possible it can be guaranteed. The process of balance and trade between dense urban communities becomes the primary focus of the human experience. The demographic dominance of cities coupled with rapid lateral expansion has led to the present “mega-disorder” status of urbanization. Vast cohorts of social inequality embody the leapfrog fragmentation of personified settlements. Recent increases in natural and human settlement disruption and destruction are producing higher rates of transnational and regional migration. The lack of formal structures that can accept public and private sectors in problem-solving roles on this issue is critical. At present, there is nothing to enable urban development planning that mitigates health insecurities, or reduces crime by means other than incarceration. The most serious of these mega-disorders is the narrowing of pathways for a growing portion of the global population to experience freedom from the fear of (fill in the blank) policies. Cities appear on the global agenda at the 1976 Habitat I conference in Vancouver, Canada. An effective urban agenda has yet to form in the United States as it remains stuck in the spread city quagmire, seduced by cheap labor and money, and hopelessly addicted to oil. The urban agenda has a chance from an unlikely source that would force the city to look in on itself. The editors of an excellent book on the subject of Food and the Mid-Level Farm make a very useful point of the importance of limiting urbanization. At farm sizes increase, the main source of economic strength for the small and mid-sized farm is through direct market operations. The growth of farmers markets in major urban centers retains a level of honesty and accountability that the immense, corporate farm, production and distribution systems cannot provide. Also, the land held must be nearby and small and mid-sized farmers can be paid for “back-loading” urban products, and a wide range of conservation services and practices that assure ecological diversity, clean water tables, forestry and land management. Leadership on the principles and practices of sustainability began with local farming. Not sustaining the value of this fact presents a grave threat to the quality of all urban life.